Divinity: Original Sin Enhanced Edition is coming, as we learned last week, on October 27. It's a major overhaul of the original game that will include new quests, combat styles, character builds, voiceovers, a "heavily rewritten story," and a completely new user interface designed for controllers—which the new version will also support, by the way. A number of those changes can be seen in action in the "console combat" trailer released today which, despite the title, is relevant to us as well. The Enhanced Edition is being released for consoles, which is probably the big news here from Larian's perspective, but it's also coming to the PC. 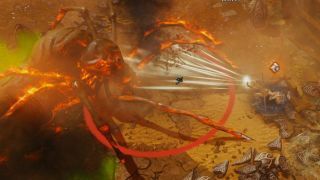 It will be free for anyone who owns the original, in fact, but it won't actually be an update: So much has changed that Larian is releasing it as an entirely separate game. And even though many of the features in the video seem console-centric, they'll also be of interest to anyone who'd like to play from the comfort of their couch—which, given the looming release of the Steam Controller, could mean an awful lot of PC gamers in the relatively near future. Divinity: Original Sin Enhanced Edition comes out on October 27.